Before we get down to business, let me pose a question, dearest reader: is there anything better than coming home from a long day at work knowing there’s pizza and good drinks in your fridge and a new episode of Survivor streaming online? Surely there are a great number of things, but for me, this evening as I at least begin to write this, life is good. Anyway. Good episode right, if for no other reason than Caleb went packing? Two times played. Eighteen days total. That is truly game-changing. I'm not going to spend much time here, but I will politely ask any CBS casting folks who are reading this (as I know there must be so many) to refrain from casting people in All-Star seasons only due to them being medically evacuated. Caleb was essentially a newbie in a season of veterans, and just as the season would have wanted, someone who doesn’t change their game gets voted out at the same spot as he left last time—yay to a whopping day nine. The athlete archetype till the bitter end, good try, buddy. You respectfully never stood a chance. Now, onto the seventeen souls still sticking it out. Two/Three episodes in and more fates are becoming clear, and I admittedly rushed to conclusions with a few archetypes (sorry Tai and JT). How the old becometh the new…with varying level of success. Not a good week for Miss Boehlke, I’m afraid. Not only did she give very little in terms of character, but she also was painfully translucent as she attempted to lie to Troyzan. She gave us nothing vital this episode—as far as both story/archetypes and strategy go—but damn, she does have a great smile. Let’s put into perspective what Cirie has done here. She appeared very down in numbers on OG Nuku to the point that even those who wanted to work with her (Zeke) were too afraid to really act on those desires all too much out of fear of being associated with a pariah. Now, not only is Zeke down to work with her, her once-nemesis Ozzy seems keen on doing so as well. Ozzy, of all people, should know what this woman is capable of, but let’s pause and think for a second about the possibility of a Zeke-Cirie-Ozzy alliance. Is it too good to be true? Almost certainly for any sort of long-term likelihood. *sigh* Let’s just hope Cirie’s newfound friends are as true as they claim to be, and her character should continue to develop nicely. Not much from my winner pick, but given her tribe didn’t face Tribal and Troyzan discovering an idol, I s’pose Sarah (and her impending victory) can chill out for another week at least. She had a good enough first episode to set herself up well anyway. Ozzy, Ozzy, Ozzy. I wonder so what the Tavua tribe dynamics are for him to want to work with Cirie. Especially in a small tribe in which physical strength is of paramount concern, who would really want to get rid of Ozzy? Somebody, obviously, but alas, I don’t think he has much of a reason to worry, at least just yet. Just sit back and wait until the Merge, my friend. Then you may want to rethink your deal with Cirie before she blindsides you like last time. Big, wonderful edit for this man. A lot of things here indicate to me Troyzan will be around for the foreseeable future. To begin with, he saw straight through Andrea, but he did so while being called “laid back” and without drawing too much attention to himself. Compare that to the old Troyzan, and wow, we might have a serious competitor on our hands. I don’t want to jump the gun again on presenting archetypes, but Troyzan is looking good, especially considering he made the old new. Let me explain. Thus far, the only major thing Troyzan has done is find an idol. Similarly, in One World, his big claim to fame was finding a HII and then playing it (incorrectly). This is a repeat of how he played in the past, however, it should be noted, his idol find was met far more sympathetically than I recall from my one time watch of Kim’s casual jaunt to victory. He was tearful as he found the clue, fearing for his life in the game. It was humbling and it showed a notable growth in maturity from his original season. The old becometh the new. Quiet-ish episode for Zeke. Despite seeming to cement a Cirie alliance and note Troyzan is on the bottom of the pecking order, we didn’t hear much from this Survivor pilgrim. I think, for the time being, that is for the best. Much like Sarah, why would we need to hear anything from him? Good tribe, not in danger, probably around for a bit yet at least. Still rooting for him. Okay. Forgive me, JT, for calling you this season’s fool. Your boring commentary episode one/two and your overall hiatus from Survivor made me forget an important fact: you dominatingly won Tocantins. Was your ploy to leave your tribemates adrift transparent and desperate? Yes. But you’re out there trying to make moves. I respect that given the odds you now face. I still think you’re destined to fall to Sandra’s majority, but you have some fight in you yet. I’m sorry to have ever doubted you. This week was fine for Malcolm. He’s solidly in the majority if he wants to be, but he looks to be keeping his options open with JT. He should be careful, however. While Malcolm is an adept player, his hubris could be his potential undoing, because if Sandra senses betrayal, the queen still has the forces to rally to her side if need be. Malcolm could find himself similar to Caleb—an athlete archetype, and we all know he’s better than that. Let’s just hope he proves it. Michaela came off well this week, I think. She displayed a few more of her heroic qualities as she spoke out against killing the goat, and she didn’t stir anything up with her tribemates. I’m still feeling an antihero edit for her, but time will only tell. 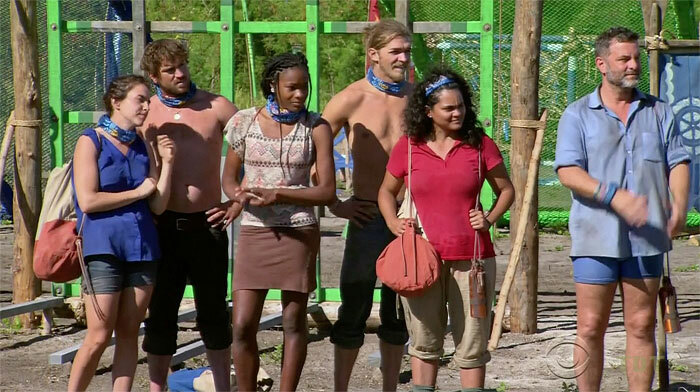 Side note here, Michaela might be in the best spot overall on all tribes. She’s strong and regardless of how the majority votes in the event Nuku goes to Tribal (which is fairly likely given two tribes apparently will this week), the monarchy (Sandra + Varner) and the rebels (JT + Malcolm if the preview is to be believed) will need to garner her favor. Your rule, for the time being, continues. While I think JT’s uprising is doomed to failure just comparing his edit to Sandra’s, something very vital happened this week. Sandra was outvoted. Not only that, but she appeared to be outvoted five to one when it came to the possible killing and eating of the goats. For a sequence that seemed trivial, the fact Sandra was not in the majority is important. She’s going to be slain soon enough, maybe right after JT. Also worth noting, Sandra is savage. She was real ready to flay those goats and gorge herself. While this was meant to be seen as a negative for her, I couldn’t help but feel intrigued. Varner was fairly unmemorable to me this week. That’s not necessarily a bad thing, and in fact it may speak to his longevity in the game (again, production will up his screen time just before his departure so we all get a taste of his lovely confessionals). Still, nothing this week indicates to me he’s going to make it to the Merge. Side note, Varner officially won’t become the fourth person to play twice and never be on the Jury! Caleb, that rascal, nabbed that title from him already. Still, there’s always number five! Did anyone have a better week than Brad? He seemed tight with Tai, solidly in control of his new tribe, and was given a whole segment on how he likes to decorate with very uplifting music playing in the background. These personalized tidbits are often times indicators of a person’s major role in a season, and while that does mean he’s not leaving anytime soon…I have to say, I’m growing a begrudging appreciation for this man’s gameplay. I hate myself for saying that, but the way he manipulated Tai was gold. Yes, I know it was just Tai and not someone socially savvier, but he knew enough not to take the obvious role as the dictator and at least have the façade that Tai made the ultimate call. Maybe him being in the finals will be deserved? Side note for Culpepper, I do not envy the choice he had to make this week. Regardless of who went home, Caleb or Hali, he was in potential danger from either a Kaoh Rong alliance or an all-ladies alliance. I’m sure he was aware of that, and perhaps this is why he discussed with Tai the possibility of axing Debbie sooner rather than later or keeping her close as she could likely be the swing in either situation. If not for the edit, I’d say Brad was in a bad spot both with numbers and tribe strength. Although her name did come up between Tai and Culpepper, I think this week was good for Debbie. There were no antics and her confessional about past relationships mattering was on the money and strategic. It’s possible she gets some votes next time, but like Varner, I’d think they’d up her screen time if she was gone immediately. Too much confessional gold to keep this woman silent. 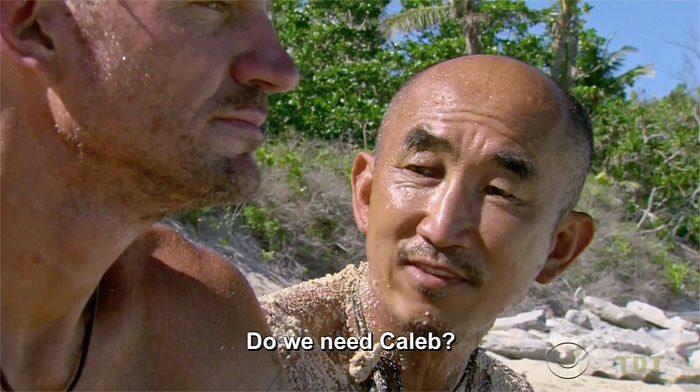 Either you’re incredibly charming or Caleb’s social game (and therefore his ability to keep his and Tai’s friendship as hush-hush as possible given how public it was) is just that horrible. Maybe both. Either way, for being one of the two people potentially going home, you were eerily quiet. Is this good? Jeez, I still don’t know. She’s hard to get a read on, but I appreciated her attorney-esque flipping of Caleb’s strengths against him. Too bad she’s on perhaps the weakest tribe, but maybe she’ll find a way to pull out a miracle. Sierra and Debbie might be open to it! Similar to Debbie, this was fine week for Sierra. She did nothing to make herself a target and she also gave a good confessional about past relationships mattering. Regardless of if Mana continues their losing streak or not, I don’t see any reason why Sierra would go home. Side note, was it just me or did she seem especially aggressive in her distancing herself from Hali. Maybe that’s strategic given the bromance beside her, and if so, I get it. But otherwise, why should we care that she and Hali have no relationship? Is this just a minor detail, or the beginnings of a whole new narrative arc? If Brad had the best edit last week, Tai surely had the worst. While he might appear in a good position, he allowed Culpepper to easily manipulate him and then looked tearful as Caleb got his sendoff. 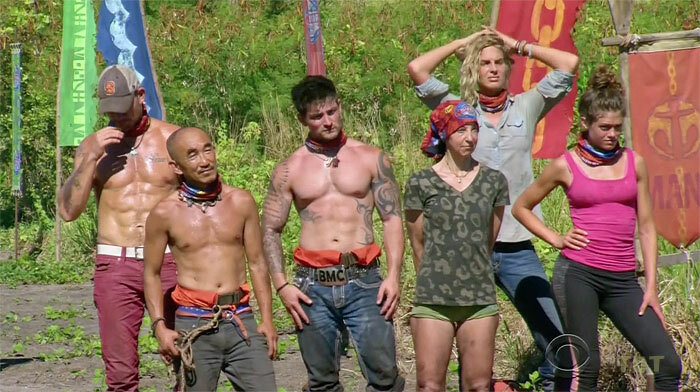 While I do not pretend to know more about Survivor than those who have played it, I don’t think crying at someone being voted out (while Hali is right there) is particularly good for tribe morale or Hali feeling secure. Even if she just escaped by the skin of her teeth, making her feel helpless is not good. Tai may not be the saint this season, but just maybe the fool. For those who read it, my previous post noted how there seemed to be a greater emphasis on subtlety, at least on some level, when it comes to changing the game. While panning to Sierra as a subtle player may imply she didn’t do much on her original season, it may also imply her longevity here. This week, I’d like to focus on three big events for three different people on the various tribes and what subtlety means thus far in the game. First, let’s begin with a move that demanded the utmost subtlety: Troyzan and his idol. I’m still debating whether or not this one was easier or harder to get than Wentworth’s first in Cambodia, but regardless, subtlety was crucial in getting his idol. While this was an important event in the game, it is one that has thus far gone unnoticed by all but Troyzan—i.e. subtlety. If subtlety does remain an overarching theme for this season, Troyzan’s chances just went way up. 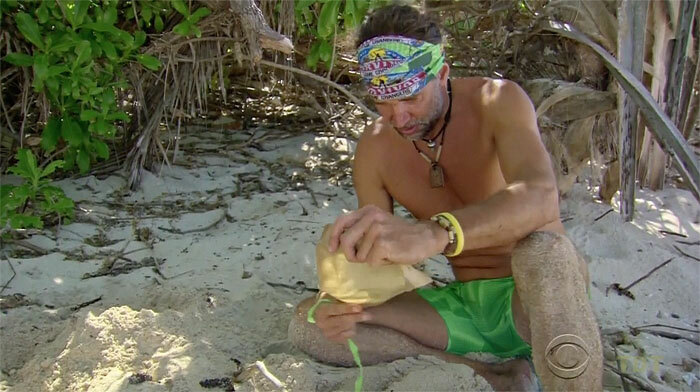 Next, there was Brad’s move of convincing Tai to “make the boot choice.” Of course, we all know Culpepper was the mastermind here (I can’t believe I’m saying that), and to us, it was about as obvious as Andrea playing dumb with Troyzan. Still, relatively to who he was talking to (in this case, Tai), Culpepper showed subtlety in his ability to get what he wanted. Bravo, bravo. Finally, we have JT and what can be described as failed subtlety. His idea to go and get pliers as a means to look for the idol was a decent enough idea (an attempt to be subtle). The fact that the other five saw through this, however, shows the failure here. JT might have tried to follow one of this season’s commandments (“Thou Shalt be Discrete”), but he couldn’t come up with either succeeding there or in finding an idol. Now why do I bring up these moves? Again, if the story production wants to tell focuses on little things really being the most game-changing elements, those who can use under the radar tactics to their advantage will be late game forces (Sierra, Troyzan, and Culpepper). Those who cannot are destined for the door—JT. My closing thought this week is short and sweet: doesn’t it seem a little premature to have another double boot episode already? 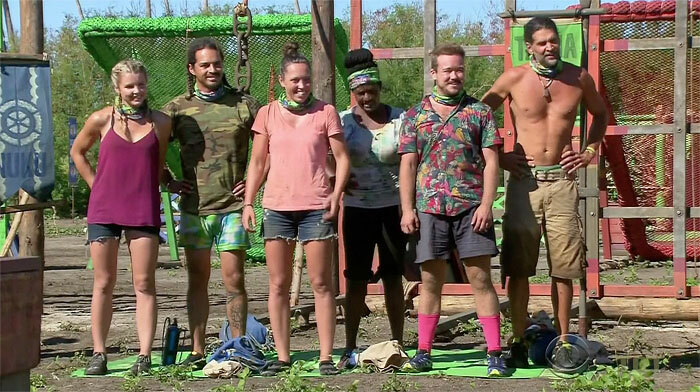 Yes, I realize Ciera and Tony technically went in separate episodes just as Ciera and Fishbach did in Cambodia, but it feels strange to me production would set up a season wherein the two necessary double-boot weeks to get down to six in a twenty-person cast would both be pre-Merge. As such, I don’t think both tribes going to Tribal will actually vote someone out. I could see the runner-up tribe in the challenge given the power to vote for one person on the last-place tribe to have immunity or even a second immunity challenge at Tribal Council to decide who actually has to boot someone. Maybe this is just fan fiction, but I think it’s too soon to have this many people gone (just look at how long it took people to get the boot in MvGX). Okay, prediction time. Assuming my above rambling are not correct and two people get kicked this week, two tribes have to lose. I’m banking on Mana (now Caleb-less) to continue its losing streak and Nuku will join them as they seem to be more developed story-wise than Tavua. The only person I think completely safe on Mana is Sierra, but I also don’t think Culpepper or Debbie are going anywhere. I’m going to go out on a limb and say Tai will get to join his bro-crush on the loser trip…and JT will be right there with them (no flipping of coins for me this week). Cheers. Hope y’all enjoyed. Thanks for the read, as always!